In the West, flying home means flying into the sunset. Even if you’re on a plane from Phoenix to Seattle, the sunset is there, flying with you, coaxing you, luring you home. Even if you’re on the wrong side of the plane, the clouds over the wing are splashed with peach and pink; the occasional mountain peak popping up below, bright in the reflected magic-hour light: that glowing hour when lamps are lit, when porch lights blink on, when home beckons. As I flew home recently from Arizona, I thought about the power of home and how specific it is. Or isn’t. Say the word “home” and watch where your mind and memory go. Is home the house you grew up in? The house you live in now? Or is it not a house at all, but the place where you feel most yourself? And why would I—born and raised in Seattle, flying back on a March evening to the family and neighborhood and city that I love—why would I also have felt so strongly at home in Sedona, Arizona? Because it’s the West, I thought. Give me red rocks and prickly pear; give me old-growth forests and fiddlehead ferns: I always feel a sense of home in the West. Much as I still love to visit the cities that shaped me in my youth—Boston, New York, London, Chicago—flying into the sunset, I savor the exhale of knowing I’m home. I am a memoir writer and teacher, so I read a lot of memoirs. So often, they are about that yearning for home: not necessarily the fondly remembered home of the writer’s childhood, but the sense of home the writer longs to feel now. So often, grief and loss have blocked the way, and the writer needs to write her way through, as Cheryl Strayed did in Wild. Her path to a newfound home was the Pacific Crest Trail. In The Seven Storey Mountain, Thomas Merton traveled far and wide before he finally found his true home in a Trappist monastery in Kentucky. In Belden Lane’s Backpacking with the Saints, home is a mountain trail, most often in the Ozarks, with the books of his beloved “saints”—from Columba of Iona to Dag Hammarskjöld to Thich Nhat Hanh—for company. In Sigrid Rausing’s Mayhem, home is where her family is, precious and fragile after a dozen turbulent years in the maelstrom of her brother and sister-in-law’s addiction. In Dani Shapiro’s stunning, elegiac Inheritance, home is where love is—her husband, her son—and where it was: the father she knew and the father she didn’t. How do we take a memory—whether it’s as snapshot-sharp as the buttes and mesas of Sedona, or as elusive as clouds billowing around a plane—and ask it to lead us home? “When Memory Becomes Memoir” is the name of a talk I gave at the Frye Art Museum’s recent conference on creative aging. Use your five senses, I urged. Help your readers not only see and hear but taste, smell and touch this memory you want so badly to share. And then see where those senses lead you. A new insight about your past, a moment of reflection, may catch you by surprise. For the rest of his life, all Paris belonged to Hemingway, even though he no longer lived there. Just as Michigan belonged to him, because he did so much of his growing up there. Just as Seattle and the West belong to me, and your beloved homes, whether by birth or adoption, belong to you. And the great gift of memory is that you can engage the imaginative twins of the physical tools you deploy every day to observe the world around you—sight, hearing, touch, taste, smell—and use them to take yourself home. Whether you’re flying into the sunset, or somewhere else that is all yours. Seattle-area readers: There’s still time to sign up for my Introduction to Memoir Writing Class, beginning April 1 at Seattle Central College. Six Monday nights. Non-credit = no stress! I thought I was going to take a quick stroll down the beach. Instead, I walked straight to the water’s edge, sat down, took off my shoes, and waded into Puget Sound. My toes dug happily into the dark, kelpy sand. My calves were electrically, perfectly cold. After a few minutes, I backed up and sat down where the tide could still lap my toes. I lifted my face to the sun and the breeze, both newly freed from the summer wildfire smoke that had blanketed Seattle for days. I felt like I’d come home, after a long time away. None of this involved thinking. All of it simply happened, as if some irresistible magnetic force was pulling me. As if I knew with my body, not my brain, that at this particular suburban Seattle beach, Richmond Beach, the thing to do was to get yourself right into the water the minute you got there. I never go to Richmond Beach. I live in southeast Seattle, and it is northwest of the city limits. But just over the hill from Richmond Beach was the home where I lived from zero to five. That much I do know, though all I remember of those first years are slivers and glimmers of our life in the little ranch house on NW 183rd Street; a jumble of memories that includes only the briefest flashes of this shore. But here I am. And here my feet are, wiggling in the cold water. And here now is this feeling washing over me, of utter contentment; a feeling that the shape of this beach and this sky and this driftwood and these train tracks all feel—right. Mine. Home. I’m a memoir writer, and I teach memoir writing at Seattle Central College. I often tell my students to take themselves on field trips; to go back, if they can, to where they grew up. 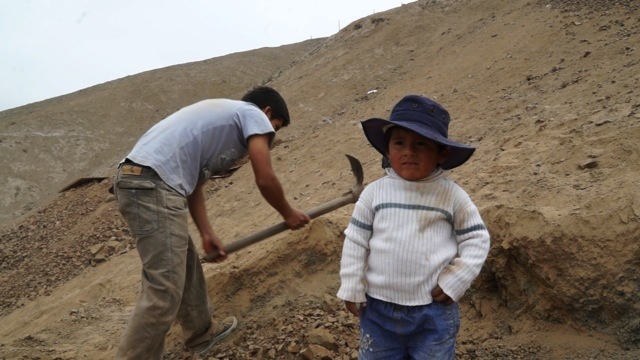 To be anthropologists, journalists, and study their own lives. I acknowledge that it’s easy for me, because the places where I grew up are not very far away. The problem, of course, is that those places have changed: like me, they’ve grown older. Or they’ve disappeared. Or, if it’s a house, someone else now owns it and they’ve remodeled or painted or replaced the rhododendrons with drought-tolerant grasses. This summer, I was invited to read at the Richmond Beach Library. The minute I put it on my calendar, I began to plan my post-reading, memory-lane field trip, first to the beach and then to 183rd Street. I had no specific writerly questions to research; I just wanted to see how it felt to be where I was in the very first years of my life, the years before reading and writing; the years in which every memory was sensory. Personal. Not complicated. We lived on a street of then-new ranch homes, just a few miles inland from the sweeping public shoreline. At the end of our block, there was a tangled green patch which we called “the woods;” I knew from previous drive-bys that it was long ago covered with more houses. I remember riding my tricycle into the woods with a neighbor boy named Bruce, my very first friend my own age, and watching, astonished, when he unzipped his pants and peed. I remember he and I got into trouble once when we tried to walk by ourselves to the nearby Tradewell Supermarket. The beach was way too far for us to even think of walking to by ourselves. And there were those train tracks. My older brother and sister knew all kinds of scary stories, told by kids even older than them, about crossing those train tracks. But when we drove to the beach, and walked from the parking lot right over the train tracks on the overpass, me holding tight to my mother’s hand, and then kapow! –that huge, sky-filled world opened in front of me—I didn’t have words for it then, and I still don’t. I just knew I wanted more of it. To this day, I want more of it. More huge sky, more water, more beach. More wildness. After I left the beach, I drove over to our old home. My route zigged and zagged around the ravines that run through the neighborhood. And then there I was, on our block, staring at a one-story, light blue rambler (it was red when we lived there) that I wouldn’t have recognized if I didn’t know the address. There were two cars in the driveway, so I didn’t feel like I could linger and stare. But I took in the shape of the house. I knew which window had been my bedroom window in the room I shared with my sisters. I walked from room to room in my mind. And then I drove away, back to the neighborhood I now call home, through a grueling Seattle traffic jam that no one could have imagined when I was five. I don’t know whether or when my Richmond Beach field trip will find its way into my writing, but I know this: for one fleeting afternoon, I remembered a bit of what it felt like to be two, or three, or four years old. I felt that sensory ecstasy, unfettered by thinking, thinking, thinking. Maybe someday that feeling will find its way into my writing. Maybe I just need to let it wash over me for a while, like the tide washed my tired toes on an August afternoon. Seattle friends: I’ll be reading with Maine poet Dana Robbins at Columbia City Gallery on September 7 at 7pm. This may look like July 2016 to you, what with the political conventions, heat waves and all. But if you ask me where I am on any given afternoon, I might say 1994. Or 1992. Or, not too many weeks ago, 1978. It is the summer of the Journals Project: the season I re-read my hand-scrawled life, transcribing not all of it—that would be WAY too brutal a task—but some important scraps. Morsels. I began keeping a journal when I was 13, so I have a lot of years to get through. The good news is that I did not (and do not) write every day. Sometimes I’ve skipped whole months, or more. But it’s taking me a while, because—sort of like eating Thanksgiving dinner—I can do it for no more than an hour or two at a time. There are only so many rich, nostalgia-laden bites a girl can take in one sitting. My self-imposed assignment is to look for anything having to do with God, faith, loss of faith, doubt, mortality and/or the meaning of life. It’s research for my next book, known for now as The Observant Doubter. Me being me, there’s a generous sprinkling of all of the above. In my very first volume, I wrote by candlelight, and used a fountain pen: a smudgy, spill-prone choice for left-handed me. But I can still remember the clink of the pen in the bottle, the scratchy sound of the nib, the smell of the ink. In the beginning, I wrote a LOT about God. 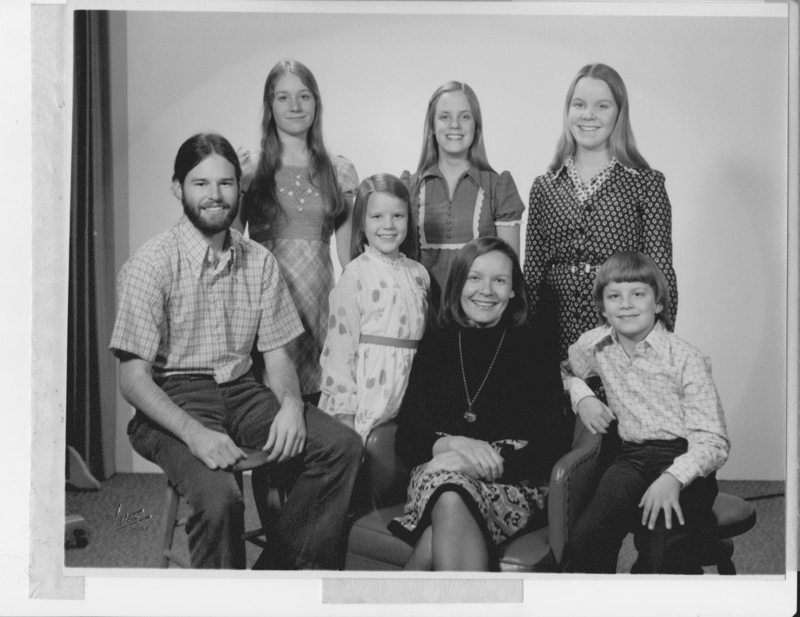 I had fallen hard for an Evangelical/ Episcopal version of Christianity that had arrived at my childhood church via a youth minister who radiated joy. I yearned to glow with the love of God, like he did. But gradually, my fervent faith subsided, and other subjects took over. I gave up on fountain pens and switched to felt tips, so I could write faster. Guilt, always a theme for me, shifted from feeling guilty because I was a bad Christian to feeling guilty because I ate too much or I didn’t study enough to, eventually, that special Mt. Everest of guilt that young mothers climb every day: no matter what you do, you’re letting someone down. You’re not doing something well enough. My transcriptions are peppered with “oy” in parantheses: shorthand for, Hey 2016 Me, can you believe how much time you spent berating yourself for your shortcomings? In 1976, 1980, 1992, whenever? Oy. How I wish I could go back and tell myself: STOP. News flash from the future: it’s gonna be OK. You are loving your children and living your life and you just happened to be born into a time when the neatly laid table of family life was upended and everyone—including you, your husband, your family, your workmates, neighbors and all those perfect preschool parents you felt you could never ever measure up to—began to scramble and squabble about how it should now be reorganized. Wow, it was confusing. Wow, it was impossible to get it all right. And now: a quarter century after I watched Bill Clinton’s inauguration with a toddler on my hip and a baby on the way, stunned and grateful that we now had someone in the White House who had invited Maya Angelou to write and read an inaugural poem, here we all are again, still squabbling over what life in America should look like. One candidate wants to take us back to… where, exactly? The mythic America of girdles and grills; of happy white people who have no neighbors who do not look like them? 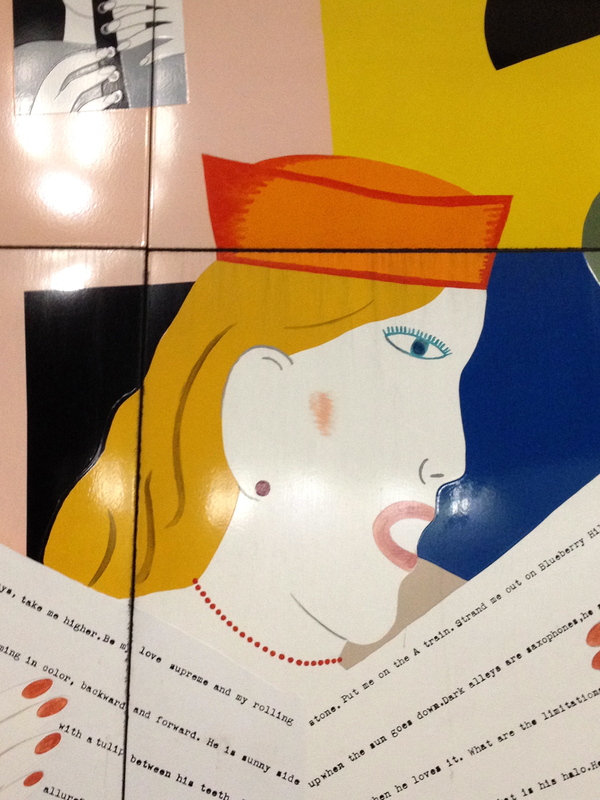 The other candidate may have been born into some version of that world, but long ago, she boarded the outbound train into the bumpy future where most of us actually live. Where women are allowed to have aspirations, even if that’s going to complicate their family life. Where fathers and mothers want to find meaning in the world and meaning at home. Through all these turbulent years recorded in my messy pages, Hillary Clinton has been working away, miles ahead of me. Making her own mistakes. Learning from them. Moving on. Preparing herself to be, as President Obama put it, the best-prepared presidential candidate we have ever had. As I continue to slog through the journals, knowing that she has prevailed over all the crazy roadblocks life has put in her way helps me to see that we as a nation and we, as women, have made progress. And will make more progress. But we’ve got to get her elected. Don’t feel guilty about how much time you can or can’t give to the cause: just do something. Just show up. I’m doing it not just for me, now, but for me, then: that fervent teen. That overwhelmed young mom. The ever-scribbling seeker of meaning that I still am. News Flash: The Restless Nest has been awarded an honorable mention in the “Blogs under 100,000 unique visitors” category of the National Society of Newspaper Columnists’ 2016 competition! “Oh, to be wracked by success!” director Terence Davies exclaimed, hitting wracked loudly and hard with his gentle Liverpool lilt. He was imitating actor Cynthia Nixon, who plays Emily Dickinson in his new film A Quiet Passion, as he explained to us that—much as he loves planning every painstaking detail of his movies in advance—he delights in moments of surprise. Nixon’s emphatic reading of Dickinson’s line was not what he had imagined. But then, success, whether or not one is wracked by it, is often not at all what we imagine. True for nineteenth century poets, true for 21st century actors and directors. True for all of us. Davies’ appearance at the Museum of the Moving Image in Queens, following a screening of his 1992 film, The Long Day Closes, was a highlight of my recent trip to New York. I had seen his Distant Voices, Still Lives some years ago and was haunted by his depiction of his Liverpool childhood, of which his violent father was the volatile heart. Davies makes movies like an old Dutch master paints. He loves what he calls “texture:” getting the faded, autumnal colors of the clothing, wallpaper and furniture of his 1950s working-class neighborhood just right; spending a full minute of screen time gazing at one patterned ochre rug, because that’s what children do: they stare at the patterns and textures in front of them. Rugs. Ladies’ skirts. A bricklayer setting bricks, one by one, in a back garden wall. I might not have been there if my husband and son hadn’t wanted to go so badly. I might have lobbied for an unaffordable Broadway show or a cozy, bank-breaking restaurant. What a loss that would’ve been. Who knew Davies would be so riveting in person? He is what you might call a case study in restless, but lovingly attentive, reinvention. And, as I wrote about last month, I can’t resist stories of reinvention. Davies has no interest in chasing a Hollywood version of success. He wants to make films the way a jeweler cuts diamonds: slowly and carefully, facet by facet until the glittering whole is revealed. If it takes years, so be it. If he can’t get the money, he’ll wait. At seventy, he still radiates a creative hunger, a hyper-attentive glow that is infectious. I hope it’s infectious. I want to catch it and keep it. New York can be maddening. Exhausting. A bad boyfriend, as one friend quipped: so enchanting one day, so brutal the next. On this early May trip, the weather was as leaden as Liverpool in March. The political weather was stormy, too: everyone still in shock over Trump’s primary-sweeping triumph; my son and I clashing over Sanders vs. Clinton. The week’s bright spots were the re-inventors. There was Davies. There was also Cheryl Stern, an accomplished Broadway actor and a friend of my good friend Lisa Faith Phillips (herself a shining example of restless reinvention: if you’re in New York, don’t miss her cabaret performance on May 15). Lisa took me to see Stern’s new one-woman show—her first—called Shoes and Baggage, at the Cell on W. 23rd. Like Davies’ films, Stern’s show is memoir, but her instruments are song and monologue. At first, you might mistake Shoes and Baggage for a light little tale about shopping addiction. But gradually, you realize it’s much more layered, more textured, than that. It’s about body image and what we women do to define ourselves in a relentlessly look-ist world. Though I’ve never tried on a Manolo Blahnik pump, I understood her story. I felt her story, especially when she flashed back to childhood, to all the approval that is lavished on a potentially awkward girl when she gets her outfit just right. The passage I read in the café was about returning after forty years to the church I last attended as a fervent teen. About how I thought I could slip in and out undetected, until an old woman asked me whose child I was. When I was in sixth grade, I fell in love with a book called How to Be a Nonconformist. I loved it because it was a playfully written and illustrated cartoon diatribe against the social pressure of the era to be cool, hippy-style, which to my ten-year-old eyes, was a rigidly conformist way of life. I grew up a mile from Seattle’s University District. Long hair, fringe vests, beads and sandals made me roll my eyes, precisely because the people who dressed that way pretended so obnoxiously to be nonconformist when, clearly, I harrumphed, they were anything but. How to Be a Nonconformist is out of print, but you can see some of it on the gorgeous Brain Pickings blog. 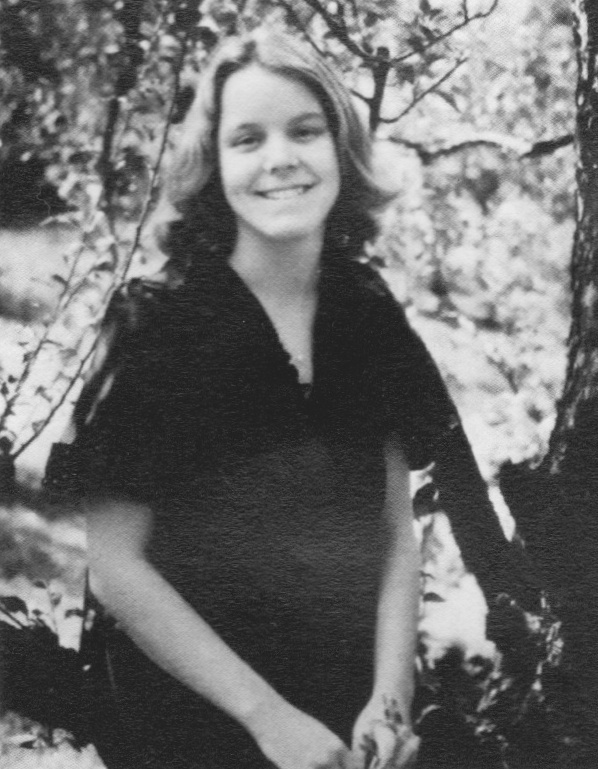 You can also read about the author, Elissa Jane Karg Chacker (1951-2008), who was just 16 when she wrote the book and went on to become a nurse and lifelong socialist, in this tribute on the Solidarity website. I am sorry Chacker did not live long enough to see what her age-mates are up to now. Because I think many of them are finally figuring out how to be real nonconformists, and to those of us who are a few years younger and in need of role models, it is a bracing trend. Reinvention is what I’m talking about. We all know that the days of working one job all your life and then retiring to a La-Z-Boy recliner are over. Sure, some people still do that, but so many of them find they can’t sit still. For starters, there are the economic realities: We’re living longer, which means we need to work longer, so we can sock away more money for old old age. Or so we can pay for all those things our health insurance for some reason doesn’t fully cover. Or so we can pay soaring rents or higher property taxes or $13 to go to a movie. But I digress. The reinvention I’m talking about is not about money, it’s about meaning. What’s interesting to me, as I think back on How to be a Nonconformist, is that so often, people’s stories of finding meaning have to do with going back to some version of what they loved most as a pre-cool ten-year-old. I have one friend who was a lawyer and is now a poet. I have a sister-in-law who decided to live in and restore her truly unique childhood home rather than sell it after her mother’s death. I have a friend who retired from corporate communications but went back to work for a nonprofit she’s supported all her life because she believes in their mission of helping homeless families. I have other friends who are doing things they’ve never done before: writing their first book or joining a choir or training in hypnotherapy or hiking the Camino de Santiago as a true pilgrim and not just for the exercise. At ten, what I loved was writing in my own, real voice: not school papers, not the journalism, press releases and documentary scripts that eventually defined my professional life, but stories by and/or about the real me. So that’s what I’m doing now: not exclusively, because it never will pay the bills, but that’s OK. It’s important to me. It’s what makes me me. And on this side of the old bell curve of life, I get that I should do what matters to me not later but now. Now, at 59, I look back on my teens, twenties, thirties and forties and think: what a time this decade has been in my life. What a time of learning to think and feel on the page. What an opportunity to accept all the contradictory parts of myself and allow them to get to know each other. It is especially meaningful to see creative me and spiritual/seeking/questioning me talking to each other. Playfully, some of the time, and quite solemnly and seriously at other times. I am grateful for this trend. I think the level of suppression, of NOT allowing such dialogues, that I practiced earlier in my life often exhausted me. Just like being perfectly sandaled, long-haired nonconformists must have sometimes exhausted the people Chacker parodied in her book. Now, all these decades later, what a relief it is that we are all allowing ourselves to be works-in-progress. To be our own ongoing experiments in reinvention. New Yorkers: I’ll be reading at Cornelia Street Cafe with poet Dana Robbins on May 4 at 6pm. Our event is titled “Word Medicine.” Hope to see you there! 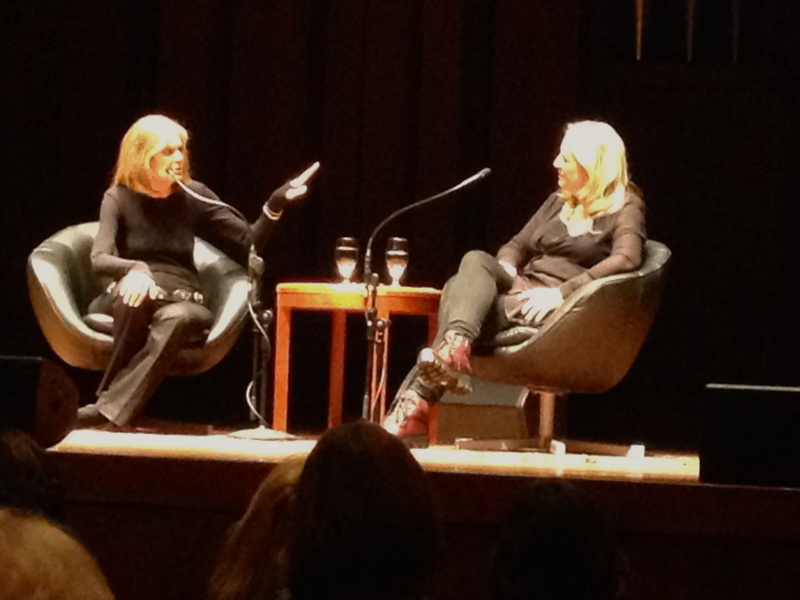 “Don’t listen to me,” Gloria Steinem told the two 15-year-old girls. “Listen to yourselves.” A packed-to-the-rafters Benaroya Hall erupted in applause, as it did dozens of times on Sunday night. But there was something about those girls. They were all of us. We have all been fifteen and remember well that panicked thought: who am I? Who will I be? Who do I deserve to be? That the two of them stood together at the microphone, because standing alone would have been too scary, made it all the more poignant. How far in advance did they plan which one of them would ask the question—what advice do you have for teenaged girls?—and which one of them would stand with her for support? When Gloria and Cheryl walked on stage, I felt as if my spine had just been plugged into a sizzling charger. My eyes started to glisten. My throat tightened. My heart did a little step-dance. I apologize for how trite this all may sound, but I am trying hard to describe how I really, truly felt at that moment, because I don’t feel that way very often. Thanks to my broadcast journalist past, I’m not instantly impressed by famous people. But Gloria is different. Gloria is personal. She changed my life. She changed my mother’s life, my friends’ lives, my daughter’s life. She changed the life of every woman, whether they know it or not. Does this sound over-the-top? I would argue that it is not. Not at all. Gloria Steinem is 81 years old (last year, when she turned 80, I discovered that she and my mother share the same birthday and I wrote a tribute to the two of them), and her life work has been to change the way we perceive women. In my lifetime, the change has been profound and global. For example, the small businesswomen I’ve met in places like Peru, India, Thailand: Gloria helped me to see them differently; to fully appreciate their strength and resilience. Or take Sahar, the Seattle-based nonprofit that is building schools for girls in Afghanistan: thanks to Gloria, the world understands how essential such work is. “Women get more radical with age,” Gloria said in response to a question about why there weren’t more very young feminist spokeswomen. Yes we do, because we get impatient. All our lives, we are told: be patient. The world is changing. Hang on! But then when you look up one day and realize your daughter is facing way too many of the same hurdles you faced—and then some, if she lives in the wrong state and might wish to do something as radical as visit a Planned Parenthood clinic—you think: enough patience already. I’m done. When I was a newly minted college graduate in 1978, the personnel director at a major publisher told me that “all our young women start as secretaries and our young men start as sales reps.” And so my first job title, post-college, was secretary. 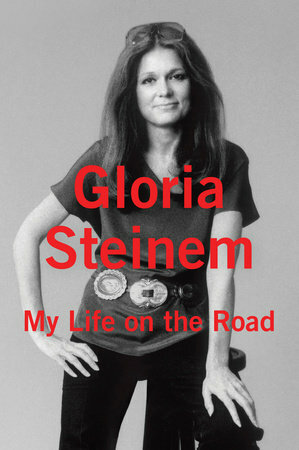 That is why Gloria Steinem moves me in a way perhaps no other public figure ever will. She understood then, and she understands now: equal treatment for all—regardless of gender, race, age or any other consideration—is not political. It is a basic human right. 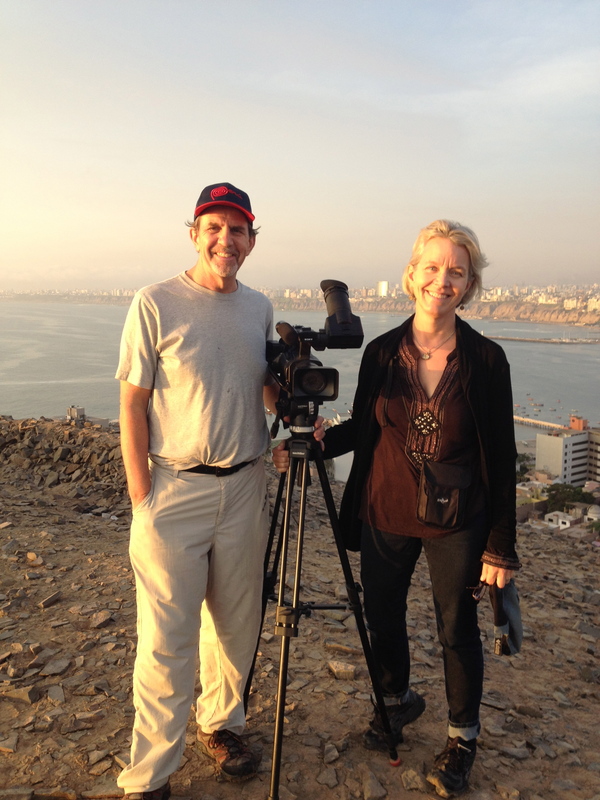 Please check out our Kickstarter page for Zona Intangible, our film set in Peru and now in post-production. Watch the trailer. Consider a donation. Our deadline is November 24. Thank you! Cacio is an old central Italian word for cheese, but I didn’t know that until I looked it up later. What I wondered, as I crossed Second Avenue on a silky spring night, was whether it might mean “gift:” as in, a gift for me; the gift of a restaurant where I would have the courage to sit and dine alone on a Friday night in New York. On any night, the East Village is chock-a-block with groups of friends and tightly clinched couples. These days, the trendiest restaurants have lines out the door and deafening crowds in the bars. But Cacio e Vino was a quieter place, just around the corner from my friend Lisa’s apartment, where I was staying. Its garage-style windows were rolled up, its tables invitingly half-outdoors. I thought I could do it. I knew I needed to do it. I was hungry and thirsty and fresh out of mojo. I wanted to do it. But after 27 years of marriage, dining out, alone, is something I just never seem to do. Or maybe it’s something I have forgotten how to do. Funny thing is, the week I’d just spent in New York had been all about female empowerment with a capital E. With the help of Lisa, who is president of the Women’s Media Group, I gave my first New York reading from Her Beautiful Brain at Book Culture on Columbus Avenue. Later in the week at Book Expo, I was on a panel of women entrepreneurs. I spent one evening with old friends from my all-women’s college and one with new friends, fellow authors with my all-women’s publishing company, She Writes Press. I even had a ten-second encounter at Book Expo with Julianne Moore, who was signing copies of her latest children’s book, in which I managed to thank her for her Oscar-winning performance in Still Alice and, gulp, give her assistant a signed copy of my book. By Friday afternoon, I was ready to rest. Lisa went out to see her mom in Brooklyn. We had plans to meet up later, but Lisa called to say she needed to stay put in Brooklyn. It’s OK, I assured her. I was exhausted, and I had an early flight the next morning. And so that is how I came to be dining alone on a Friday night in New York. You must do this, I told myself. It’s too beautiful an evening to get take-out and hide in the apartment. I walked in to Cacio e Vino. The waiter offered me a choice of tables. I chose to look out on the street instead of hiding along the wall. He brought water and bread with fragrant oil. I ordered a glass of wine and a plate of pasta with zucchini, mint and goat cheese. Mint! Why not? I didn’t have a book with me and I didn’t want to stare at my phone, so I pulled out a pen and a few note cards I’d bought. But for a long while, I simply sat and sipped and ate slowly, gazing out at the soft lights along the avenue, watching the New Yorkers walk by. A young couple, oblivious to all but each other, stood outside Cacio e Vino for several minutes. Eventually, they came in, which made me happy, because I knew they’d love it. And because the sight of me, a solo diner so quaint as to have note cards and a pen on the table, had not scared them off. It’s strange now to try to articulate the reasons why I might not have sat down and enjoyed that solo meal. Was it that I did not want to be looked at and pitied? Was I afraid someone—a man, most likely—would spoil my solitude by trying to strike up a conversation? This is much less likely to happen to me now, in my fifties, than it once was, and maybe that bothered me, in some illogical way. Was it the money? Did it feel too indulgent, spending restaurant dollars on me, alone? But here’s the real question: would a man ever, ever go through these mental hurdles before he took a seat at a restaurant table for one? What’s odd is that sometimes I secretly daydream about dining alone. When I’m at a restaurant with other people, I have thoughts like: oh, that small plate would be the perfect thing to eat alone. And yet back in Seattle, if an evening comes along when I could actually do such a thing, I never do. But maybe now I will. Because here’s what I learned, last Friday night in New York: after a week of wall-to-wall empowerment, it was wonderful to be alone, and taken care of by a good waiter. As if I deserved it. 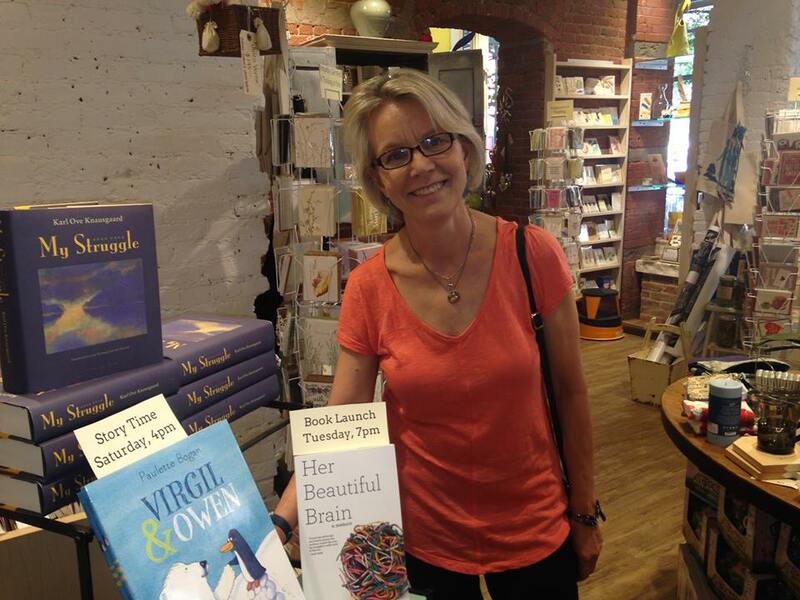 Buy Her Beautiful Brain from the small or large bookstore of your choice. Find a bookstore here. Order the Kindle version here. An audiobook version will be available later this year. If you aspire to be a cool writer, then whatever you do, don’t hang out with me. I am your worst nightmare. Here’s why: for starters, I am old, so old I may as well tell you how old. 58. Fifty-eight! This would be acceptable if I had published many volumes by now. But no: I just published my very first book. And my book is a memoir. This might be acceptable if I was a recovering addict or had escaped the Taliban. But no: I am the daughter of a beautiful, smart woman who drew an unlucky card called younger-onset Alzheimer’s disease, and that is what I wrote about. Worse, my current work-in-progress is also a memoir, on an equally unhip topic: faith and doubt. There’s more. I did not get my Master of Fine Arts degree until I was 53: enough said. And I have another career, which confuses people. It’s a reasonably cool career—documentary filmmaking—but alas, I’ve never had a film at Sundance (which would vault me right into the category of Permanently Cool). And I make films with my husband, which is way less cool than if I were doing it solo. Speaking of my husband: we’ve been married 27 years. Yikes! Just call us Ward and June! And then there’s my lifetime issue of not wanting to be mean. In fact, right now, writing this, I’m uncomfortable with the whiff of snarkiness I detect; the implication that I don’t like cool writers, because I do. I like many cool writers. But that is not my point. My point is this: over my 58 years, I have learned, sometimes reluctantly but ultimately with relief, how wonderful, how freeing, it is to live life as not only an un-cool writer, but an un-cool person. My education in un-coolness started early. There were painful drills, there were pop quizzes. But I faced my first big exam at the beginning of 9th grade at Seattle’s Eckstein Junior High School. All the aspiring cool girls, my sad self among them, hoped to be selected for something called “Girls Club,” which involved wearing special scarves and blouses once a week and engaging in lightweight service projects. Really, “Girls Club” was a sanctioned clique. My best friend—the one with whom I’d bought journals and real fountain pens and candles and browsed for old-fashioned children’s books at David Ishii’s bookstore in Pioneer Square—made the Girls Club cut. I did not. She dropped me with stunning speed. When I came up for air after a good long cry, I realized what a great gift this was. I had been spared all the stress and effort it would have taken to retain my status as a Girls Club girl. I was free! Free to be my un-cool self. To keep on writing in my ink-stained journals; to keep on riding my bike to David Ishii’s or the Arboretum or anywhere else I could curl up with a book, undisturbed by cool people. My junior high years coincided with my parents’ divorce, which, in that long-ago era, was definitely not a cool thing. But it was my Goddard College MFA advisor, Victoria Nelson, who helped me understand, decades later, how the divorce contributed to my liberation. All those hours I spent babysitting my younger brother and sisters while my mother went back to college gave me freedom to continue on my un-cool, future-writer path: unsupervised by adults, unseen by cool peers, I could write my fervent, un-cool poems and journal entries and read, read, read while my siblings watched cartoons or played. Sometimes we played school, with me as teacher. Or pioneers, or explorers. So not cool. I loved it. And now that I’m a late-blooming, un-cool author, I’m more grateful than ever for the un-cool path that got me here. Not much I can do about my age. Nor my attraction to the wrong subjects. Nor my love of memoir writing, the actual hours spent writing, for which I credit my first Goddard advisor, Michael Klein, who taught me that memoir writing could be part poetry, part journalism, part essay: a hybrid, a blend, not unlike documentary filmmaking. Not unlike the way my restless brain has always worked. The path of the un-cool writer is unpredictable. It’s more likely to result in rewards that can be measured in moments—conversations I’ve had after readings, emails from long-lost friends—than in big royalty checks or New York Times reviews. But it is the path I’m on, and I am grateful every day. Upcoming readings: April 1, 7pm: St. James Cathedral Parish Hall, Seattle. April 30, 7pm: The Regulator Bookshop, Durham, North Carolina. 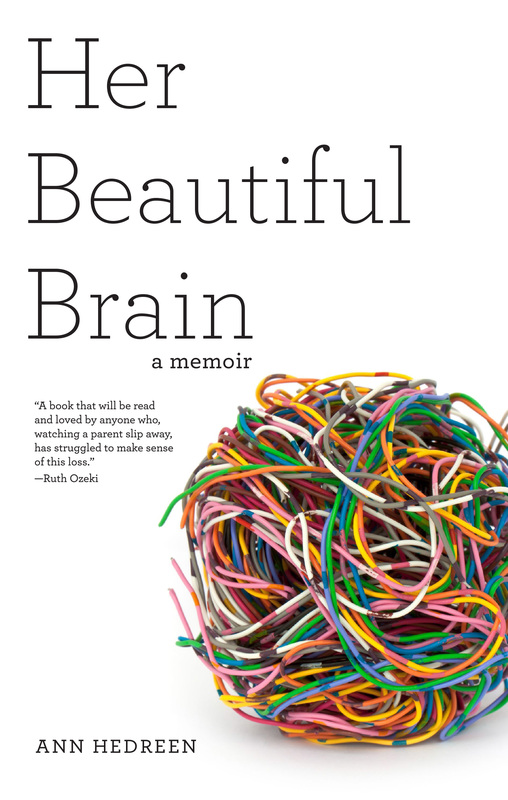 Buy Her Beautiful Brain from the small or large bookstore of your choice. Find a bookstore here. Order the Kindle version here. Here are two of the many things that scare me: having to change a tire all by myself (because I’ve never done it) and camping in bear country (because I have). Here are two of the few things that don’t scare me: taking pop quizzes and getting poked with needles. These slim categories of fearlessness make me a natural volunteer for Alzheimer’s research. My mother grew up in Montana and nothing much scared her. She not only changed tires, she put chains on tires by herself, tying them together with shoelaces if they didn’t fit right, lying under the car in a snow storm. As for camping, after a twenty-year hiatus, she decided to try it again—solo, with four children in tow. We didn’t see any bears. The worst thing that happened was that we forgot spoons for our cereal. The best thing was being with Mom, far away from all of her city responsibilities, laughing along with the rest of us as we slurped our Raisin Bran and milk from our cups. What was so frustrating, of course, was how little we could do for our mother. Medicine offers no antibiotic, no chemotherapy, no surgery or drugs beyond a few pills that might slow the progression of dementia. We could give her our time, ourselves, the joy of grandchildren, the pleasures of a walk or chocolate or music. 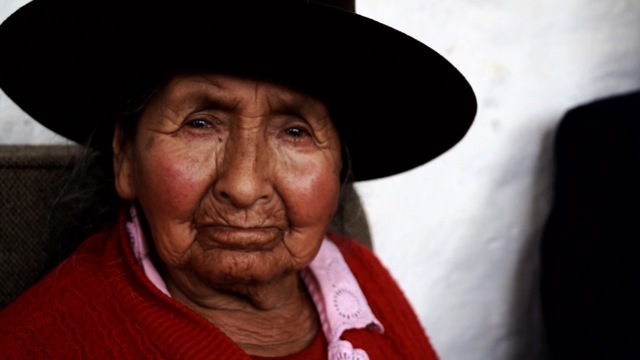 What we could never give her was our sorrow and rage about Alzheimer’s. So what could we do with those emotions? One answer I found: volunteer for research. For me, it started by accident. Twelve years ago, I looked up the University of Washington Alzheimer’s Disease Research Center (ADRC) in the phone book (remember phone books?) and gave them a call. 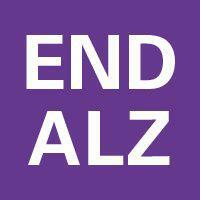 I was seeking scientists to interview for a documentary about Alzheimer’s disease. But the administrator surprised me with a question of her own. And so, as I wrote in my book, I found myself in a room at Seattle’s huge VA Hospital, where the ADRC is located, taking all the memory tests I’d watched Mom flunk. The tests start with questions like, What day is it? Who is the president? and progress through tasks like spelling WORLD backwards, listening to a paragraph and recalling details ten minutes later, repeating back sequences of numbers, remembering short lists of words, distinguishing the words for colors from the actual colors, going back to that paragraph and recalling it again, going back to those numbers and doing the sequences in reverse order. Despite my test-taking bravado, was I nervous? You bet. Am I glad I did it? Definitely. Note: I wrote this post for the Alzheimer’s Association’s brand-new regional blog: check it out here. Registration is open for Introduction to Memoir Writing at Seattle Central College. Starts February 11, 2015. Six Wednesday nights. Non-credit = all inspiration, no stress! 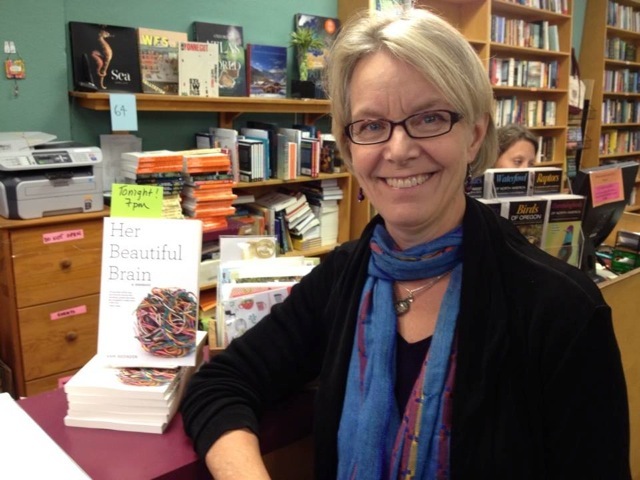 I’ll be reading from Her Beautiful Brain at Ravenna Third Place Books on Thursday, February 12 at 7pm. You can pre-order it from Third Place or from the small or large bookstore of your choice. Find a bookstore here. Order the Kindle version here. Radio lovers: you can hear the Restless Nest commentaries every Tuesday at 7:45 a.m. on KBCS, streaming online at kbcs.fm and on the air at 91.3 in the Seattle area. Podcasts available too. The Old-House Drive-By: surely I’m not the only one who does it. I’m not talking about the house I moved out of three years ago, the house where I raised my children. I’m talking about the Old-old house: the house where I grew up. As Seattle houses go, it’s a dime a dozen: just another Tudor cottage on a north-end street. But it is still standing, which you can’t count on any more in this town. In fact, it is so close to the ever-expanding campus of Children’s Hospital that its future is not in any way certain. Why do I do it? The drive-by. It’s not like my childhood was a perfect idyll. It’s not like every memory I associate with that house was a happy one. But it is where I became who I am. Where I grew from the chubby five year old I was when we moved in, to the awkward pre-teen with the pointy glasses I was when my dad moved out, to the college girl I was when we all moved out. 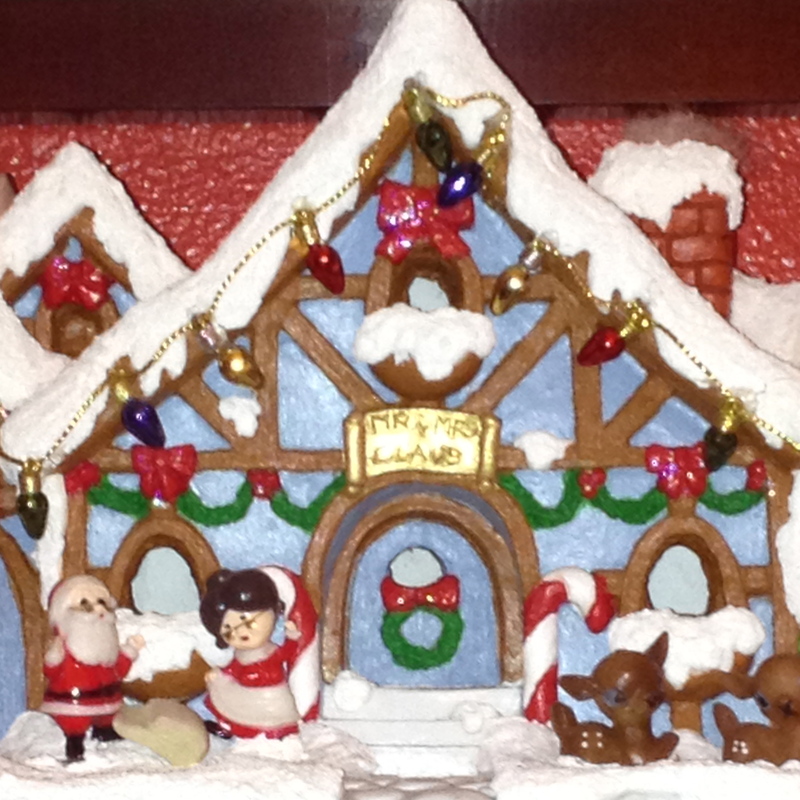 Home after my first-ever year out of the country, distracted by my first-ever real romance, I was not really taking in what my mom had just told me: we were leaving the Hansel and Gretel cottage and moving to her new husband’s house. We had two weeks to pack. We packed. We left. We were all distracted that summer. And so we didn’t really give the house a proper good-bye. Maybe that’s why I keep circling back. Why I found myself, on this dark December night, driving the deserted North end arterials that are imprinted on my brain in a way the arterials of the South end, where I have lived for 24 years, are not. As I approached the house, I kicked into a familiar version of high alert, butterflies beating inside, as if I was about to do something—forbidden. I slowed down. I kept my eye on the rear view mirror. No cars coming: I could dawdle. The curtains were open. Through the glass of the old leaded windowpanes, I could see a Christmas tree in the corner next to the mantel. The white lights on the tree made the stucco walls glow. I could just glimpse the dining room through the archway where we had all crouched on the morning of the 1965 earthquake. I couldn’t see any people—they must’ve been in another room, perhaps watching the game. But the house looked alive, as in: full of the life of the family that lived there. As it should look. As I would wish it to look. How lucky I am, to be able to see that. So many of the brick apartment buildings in Seattle, built in the same era as our Tudor cottage, are now giving way to glittering high-rises. My mother’s childhood homes in Butte, Montana were all sacrificed to open-pit mining. But I can still drive by, on a winter night, and see the old house: windows outlined in Christmas lights, tree in the corner, car in the driveway. Another family inside, loving and growing and going out into the world.